The day started as it always does, with coffee and a crying baby. As E got the little dude dressed, I packed the provisions in the car, chugged a bunch of water, and ate a bagel. Forty minutes later, and forty five minutes before the start, we were pulling into Burlington. I had expected to park in the same lot I’d parked in when I ran this race five years ago, but it was full. As was the five story parking garage near church street, and the side streets all around. Thirty minutes to start time and I have nowhere to park the car. Twenty five minutes to start time, E tells me to park it in a drug store parking lot. “It says parking for customers only”, I say, “and even then, only for an hour”. “I’ll handle it” she says. And, though I leave her with a screaming baby, and a car she cannot drive, she does — because she is amazing. On to the start, where I find Joe. We hit the porta potties. We wait. We fret. And then the gun goes off and we run. The first miles fly by; we cruise along trying to keep the pace somewhere between 8:50 and 9. We want to go faster, but we play it as conservative as we can. More than anything today, I want to break four hours. I’ve been at this running game awhile and I feel like it is finally time to join the big boys. I put together one of the best training blocks of my life, basically injuring free, and (for me at least) consistent. Of course I worry it wasn’t enough. The miles fly by. We chat with an older woman who’s run 75 marathons and swum across Lake Champlain. We see some of the fast dudes who’ve filled out the Boston Qualifer Questionnaire. We chat about what we always chat about: running, getting old, and why the hell we continue to live in NYC when any rational person would have left years ago. I’m having a good time. By the halfway mark, I feel strong and the miles seem easy.\ I want to keep it conservative. Joe is feeling like picking it up. I let him go. He’ll go on to his own struggles, but will finish far ahead of me. At the bottom of the mile 15 hill, I see E and the Little Dude. He gives me a high five. Everything is going well. But that hill is long, and by the end of it, I’m starting to feel the miles. I carry on, trying to keep the pace. By mile 18, my calf, and then my groin, begin to cramp. At first it’s just a little tweak. It’s almost eighty degrees so no surprise that I’m feeling it. I drink at the aid stations, trying to keep any serious cramping at bay. The four hour pace group passes me. My dreams for the day start to fade. But by mile 22, I am cramping so badly, I can’t walk. I actually stumble just outside the mile 22 water station. EMTs help me to a chair, ice my legs and give me Gatorade. “We can get a car to come get you”. “I’m almost there, I’ll finish”. And so I do. The 4:15 pace group passes me. Then the 4:30. I hobble along. I run until I cramp up, then I walk, then I run again. I am not a pretty sight. I try to run the final mile, but my left leg seizes up again and I almost go down. This time, it happens right by the beer tent. People see me hobbling and they cheer me on, shouting my name. I was hoping to do much better than this. But whether it was a lack of training, or a nutrition issue, this isn’t my day. I cross the line in 4:39:27. Not my worst performance in the marathon, but certainly not my best. The marathon is fickle. You put so much time and energy into training for it and then, it can all go so wrong. I find is humbling, frustrating, and, frankly, addictive. New York has got to be different. I’ll need to up the training game, both in terms of mileage and speed work, but perhaps most importantly, consistency. And though I’ve resisted it for years, I’m going to have to learn about nutrition. Expect more posts about all of that in the future. Now its two days later and I’m planning my revenge. Today, I’ll rest my legs, drink water, work my sore muscles with the stick. Tomorrow, I’m going to go for a run. Any race that ends with sharing a medal with this guy isn’t all bad. The challenge of running a successful marathon is a large part of the fun for me. It has the right amount of difficulty and uncertainty that it appeals to that certain individual who is willing to put in the time and reap the rewards at a future date assuming the weather and the body cooperate. I agree with you it’s an addictive game. Yes, its a very all or nothing thing. You’re either over the moon because ever went perfectly or you’re crushed because you just spent months preparing for a disappointment. Still, I always want another shot. Well done dude. Good fight. You’re a champ. Rest up, get strong and hit the NYC hard. Thanks, man. It wasn’t pretty, but its done, and it should be good training for gutting it out during our presidential traverse! Thanks for continuing to write about your efforts. As a fledgling runner, it’s very inspiring and educational for me. It seems like there’s a big gap, physically and mentally, between a half and a full marathon that makes being able to run the half well not a guarantee for running the full. I know others have said the same– I wonder if there’s a strategy for that. I look forward to your thoughts on nutrition as well. Thanks, Lisa. As many have said, the marathon is more than twice as long as a half. A reasonably fit person can fake their way through a decent performance at a half marathon, not so at the full where all our weakness are shown to the world. Great job in Vermont! I probably would’ve used the EMT’s words as excuse to just bail (“well, the EMT told me to stop so…”). Way to tough it out. Getting chewed up during the last third of the marathon is what keeps me cranking — hitting the road and pushing away from the dinner table can be tough but easier when you remember the agony of that last 10K+. Your BQ questionnaire has been a regular read for me ever since I got it into my head to BQ (which I manage to eke out in December). Keep up the great work and good luck with your training for NYC 2015! 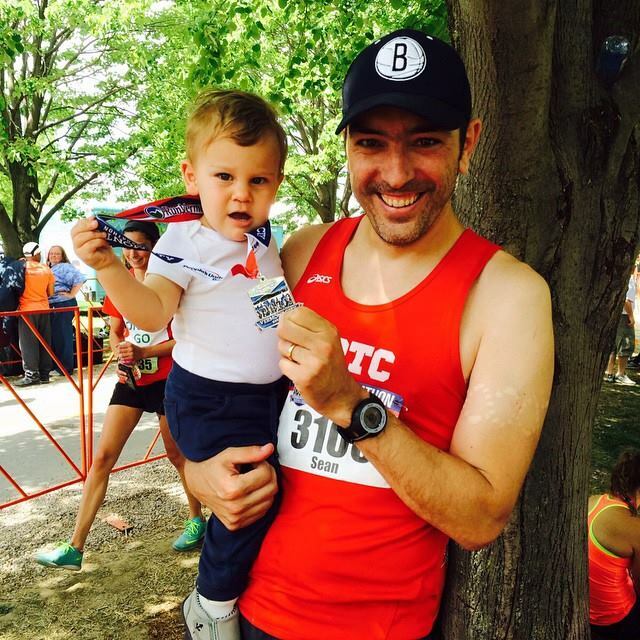 Thanks for the kind words and congratulations on the BQ! I’d love to share your story as part of the project! Get in touch!